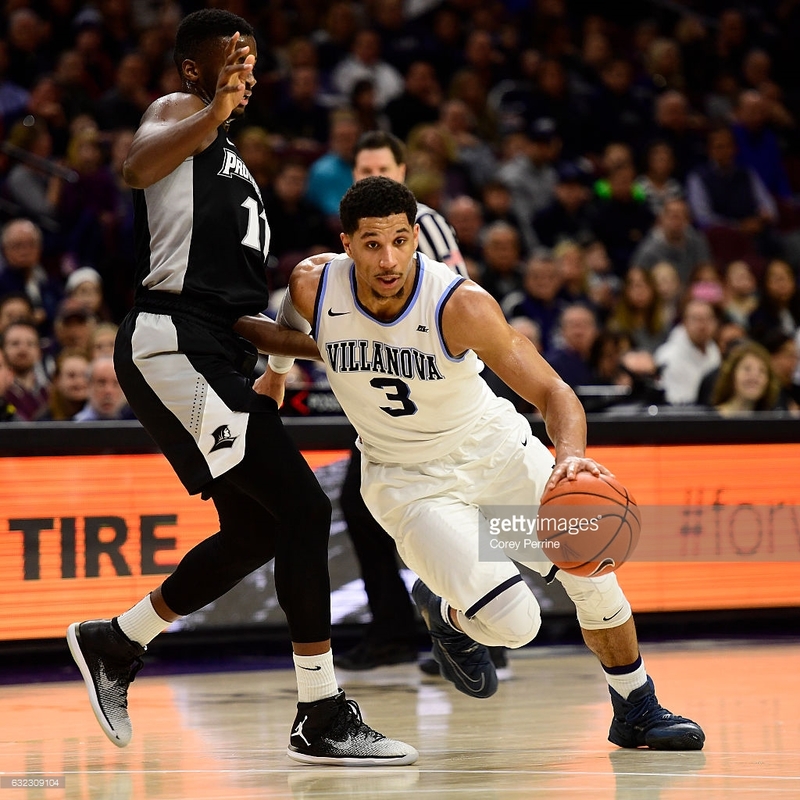 The Providence Friars took to the road to take on the #1 team in the country and defending National Champion Villanova Wildcats and came up a bit short by the end of the game. The Friars were able to get things close at times, taking a 4-point deficit into halftime, but ultimately the Senior combination of National Player of the Year candidate Josh Hart and Kris Jenkins were able to make plays whenever the Wildcats were in need of a run in the 2nd half. Basically, in order to beat Villanova, you need to hope that they have a really tough go of things from three point range. Without the inside presence of a player like Daniel Ochefu from last year’s team, Nova can at times, rely too much on the 3-point shooting of this year’s squad. Kyron Cartwright was sidelined in the 2nd half with a stomach bug which really ended putting the Friars out of reach. Not to say that they would have won with Cartwright in there for the 2nd half, but it most certainly made it much tougher to pull off an upset on the road against a very good Villanova team. That aspect reminded me of the Creighton game in that you can easily see the difference in the Friars ceiling as a team without Kyron Cartwright. They need all their studs in order to compete with the best of the best. We’ll start with the Friars this time and then move onto the Champs. Kyron Cartwight was limited to just 29 minutes for the game while battling with a stomach bug. In that time, he was able to make a direct impact on the game, scoring 12 points, handing out 5 assists, and grabbing 3 rebounds. He shot 5-11 from the floor and at times looked to be starting to take over the game in the 1st half. Unfortunately, no one else was rising to Cartwright’s level, at least not in the beginning of the game. I have to be honest, I’m not loving how these videos from twitter embed on blogspot. I can’t seem to change the size or center them in the middle of the page. We’ll see if that changes in the future. Vine was so freaking simple to use. What a shame. I feel like this is becoming the norm for Rodney Bullock, pretty good offensive numbers when you look at them after the game but just seems to come and go as being able to take over a game. Rodney finished with a team-high 17 points on 6-12 shooting. That’s good. Rodney also finished with a team-high 5 turnovers and 0 assists. These high turnovers are really hurting the Friars, especially when they are trying to go on runs against an elite opponent. Emmitt Holt looked really good but only took 6 shots in 38 minutes of playing time. Holt looked good offensively but really needs to push the issue offensively at times to make a bigger impact. Look at it this way, Isaiah Jackson played just 19 minutes and they finished with the same number of shots in the game. If it takes some more pick-and-roll or some slip action to get involved, I’m all for it. Speaking of Jackson, this may have been the best game I’ve seen from him this year. 14 points on 4-6 shooting from the floor including a perfect 3-3 from distance. He also had 4 assists vs. 0 turnovers and 2 steals. Great game off the bench from Jackson. Jalen caught fire for a time, connecting on 3 straight threes in a matter of a couple of minutes (if that). Lindsey finished 4-7 from three for 14 points. Alpha had a pretty off game, shooting 0-5 from the floor and turning the ball over 4 times. In a silver lining, he did go 5-6 from the free throw line. Other than that, he didn’t provide much for the Friars in this one. Ryan Fazekas, Maliek White, and Kalif Young played limited minutes off the bench as Cooley cut down the lineup against Nova. None of the three guys scored. Josh Hart is good. Like really good. Of course Kris Jenkins picks this game to finally break out of his slump this year. Thanks Kris. I think I changed my mind, I’m going to hate Donte DiVencenzo waaaay more than Jalen Brunson over the next couple of years. Man, Freshman Eric Pashcall can sure foul can’t he? I was hoping to see what kind of player we had on our hands but he couldn’t stay on the floor, fouling 4 times in just 10 minutes. Just as an FYI, the Friars beat the spread of -17, just saying.